Safety and pressure relief valves are common elements of any pressurized system. Their general purpose is to provide a positive means of preventing system pressure from exceeding a preset value, avoiding uncontrolled events that could result in damage to personnel, environment, or assets. Their operating principle and construction are comparatively simple and well understood. 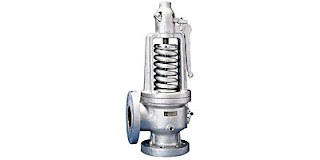 Long term exposure of a relief valve to certain types of process media can result in corrosion, material buildup, or other conditions which may shorten the useful life of the valve, or worse, impair its proper operation. This excessive wear will increase the ongoing cost of maintaining or replacing a prematurely worn valve. One other aspect of relief valves can be the reduction in their seal integrity or force as the system pressure approaches the setpoint. This could possibly lead to fugitive emissions, an undesirable condition. An effective approach to mitigating some of the effects of exposure to the process media is to install a rupture disc upstream of the safety valve inlet. Isolating a relief or safety valve from the process media through the installation of a rupture disc upstream of the valve inlet eliminates exposure of the costly valve to effects of the media. It is necessary to establish proper rating and selection for the rupture disc to avoid any impairment of the overall operation of the relief valve, but the selection criteria are not complex. A number of benefits can accrue with this concept. Rupture disc isolates the valve from the media, allowing application of less costly valves fabricated of non-exotic materials. Rupture discs are leak free and bubble tight, eliminating possibility of fugitive emissions from the safety relief valve, especially when system pressure may approach valve setpoint. Relief valve inventory can be evaluated for reduction. The additional cost for the rupture disc enhancement can have a reasonable payback period, with all factors considered. In any case, the rupture disc protection makes for a cleaner relief valve installation. Rupture discs and holders are available in sizes and materials for most applications. Share your ideas with a valve specialist, combining your process knowledge with their product application expertise to develop an effective solution.